It is with the image of a meditative and proud pope that LagosPhoto will open in November, a month later than its set calendar date. Almost two decades after Maurizio Cattalan’s installation “La Nona Ora” (“The Ninth Hour”), in which John Paul II lies on the ground having been crushed by a meteor, the pope will resurrect in Lagos during this 8th edition of the festival, with the debut of the brand-new series “Black Pope” by Samuel Fosso. Immediately, I thought of how in religion, truth and faith have always been kept together by the magical effect of power and its officiants – whose face, in Catholicism, has not escaped the white-washing of history. 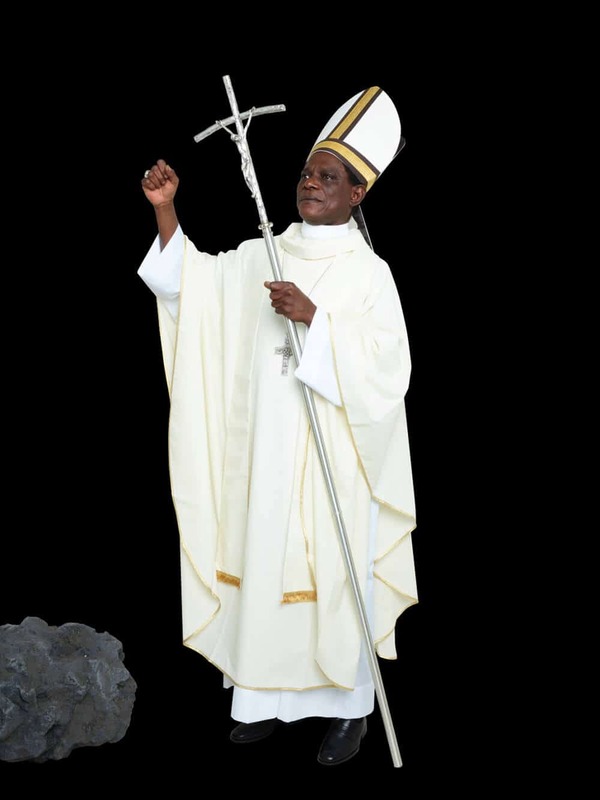 Fosso’s papal disguise is reminiscent of the involvement of Church in slavery and colonialism. It speaks of the quest for an African theology and for the contextuality of truth. Fosso makes us also reflect on our exceptional faith in art, which is able to bring us together, beyond sociocultural differences and geographical origins. Art is a global religion, it has its own temples, language, dicta and uses its own strategies to bond truths and belief; or, paraphrasing Achebe, it calls us to acknowledge and believe in the truth of its fiction. In the age of the late capitalism and information society, the question about the regimes that dominate our understanding of truth, belief and reality has a global relevance. As announced by Baudrillard few decades ago, the fragmented constellation of plural, relative truths has turned into the regime of hyperreality, in which “from medium to medium, the real is volatilised, becoming an allegory of death”. However, it is in the context of the African continent that this question becomes particularly important. Mahmood Mamdani suggests that we should distinguish between two different kinds of truth: one that opposes truth to power, and another that links truth to power. According to this distinction, we see how the quest for truth was fundamental to the early African liberation struggles and to the ongoing emancipation from the colonial hegemony of certain models of thought. On the other hand, we see how institutional truth can conceal inconvenient realities with the aim of maintaining the status quo of power, while offering social peace in exchange – as demonstrated by the experience of South Africa’s post-apartheid transition. Nadine Ijewere, from the Aweng series. 2017. Courtesy of the artist. Titled “Regimes of Truth”, LagosPhoto 2017 will run from the 24th of November until the 15th of December. The recent published press release has finally revealed the list of participant artists, a mix of established and emerging photographers, mostly from the continent and the diaspora. Alongside Samuel Fosso’s “Black Pope”, LagosPhoto will debut several new photographic projects on commission, including Osborne Macharia’s No Touch Am, Leonce Raphael Agbodgelou’s Love and Fear Woman 2017, Cristina De Middel’s Unknown Soldier 2017. 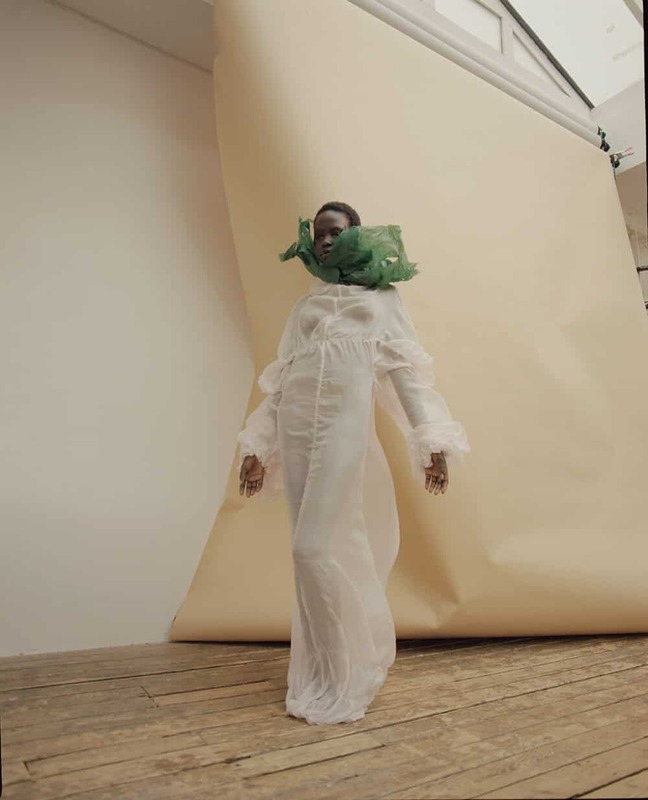 The selection includes the work of young and talented artists from Nigeria who draw inspiration from fashion imagery and photographic codes, such as Kadara Enyasi, Logo Oluwamuyiwa, as well as the intriguing images of Ruth Ossai. This 25-year-old photographer appropriates the language of fashion photography to explore and, sometimes, to caricature the manifestations of contemporary Igbo identity, by portraying people’s dress codes and body attitudes in front of the camera. On the same line, Nigerian-Jamaican Nadine Ijewere will present her series Aweng, in which she continues her delicate and sophisticated exploration of the interplay between fashion and portraiture, approach that made her popular amongst major brands in the press and fashion industry. Other two prominent female presences will be Joana Choumali and Owanto Berger. Talented photographer who co-represented Ivory Coast at the 57th Venice Biennale, Choumali will present a brand-new project titled Translation, composed of very delicate black and white images intervened with handmade colorful embroidery. French-Gabonese multimedia artist Owanto will show for the first time Dance with me, a project whose images result from a process of collage in which the artist mixes old and recent photographs, belonging to different situations, geographical and cultural context, giving birth to a new and feminine universe of historical and cultural entanglements. These suggestive images are placed into deep boxes stacked made of metal or Okoume wood from Gabon, and are combined with colorful neon board writings and screens. Owanto will also present a body of works from her photographic series Flowers, inspired by and in a controversial dialogue with a family inherited box of archival photographs documenting female genital mutilation ceremonies in West Africa – a project that is currently travelling the world, from the recently opened Zeitz MOCAA (Cape Town) to this year edition of 1:54 (London). We also anticipate the participation of the Franco-Algerian multifaceted artist Amina Zoubir, mostly known as a filmmaker, performer and art curator, as well as of the young and talented Jody Brand, whose work explores, with a unique sense of familiarity and confidence, the subjectivities and the glamourous aesthetic codes of the Capetonian black queer trans communities. 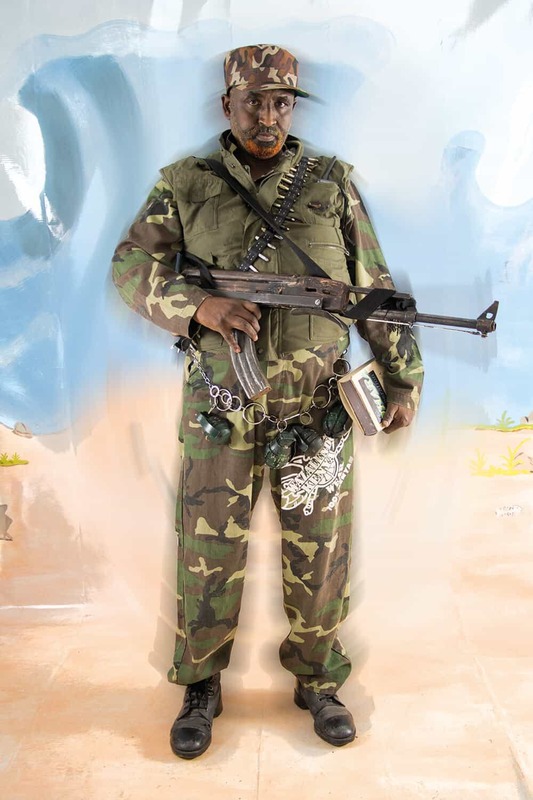 Included in the panorama of prominent names of contemporary African photographers is the internationally acclaimed conceptual practitioner Kiluanji Kia Henda, winner of the 2017 Frieze Artist Award; Alun(be), architect from Senegal who lives between three continents and whose photographic work mostly explores human condition, subjectivities and bodies in public spaces; and Kenya’s first-ever Cannes Lion winner, Osborne Macharia, who brilliantly contributes to the hybridization between advertising or fashion photography and contemporary art. 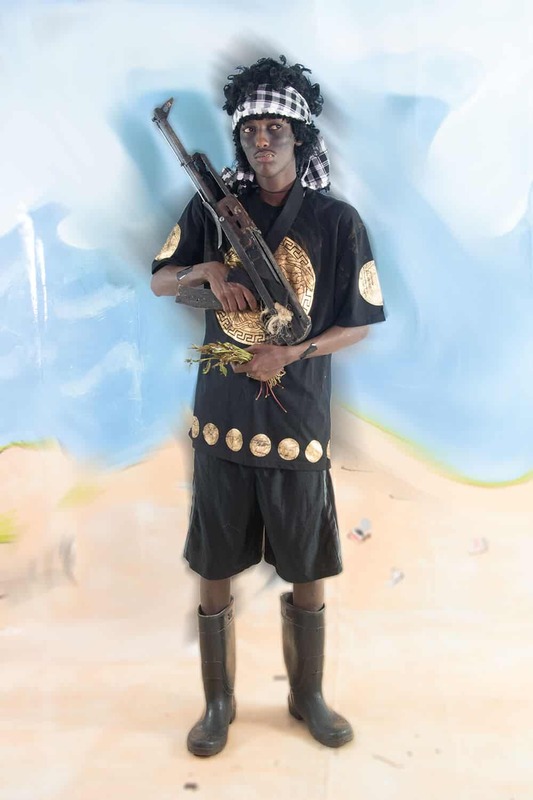 While Macharia’s work is along the line of the experimentations by Namsa Leuba, who participated in the last edition of LagosPhoto, he manifests a deeper engagement with his fictional figures, through which he challenges gender stereotypes and addresses socio-political issues. Moreover, as in prior LagosPhoto festivals, this 2017 edition will feature the work of few European and North American artists that engage with African realities and other social contexts. Among these, the name of Jan Hoek stands out for his provocative and ironic work that emerges from a truthful and playful relationship with his models. 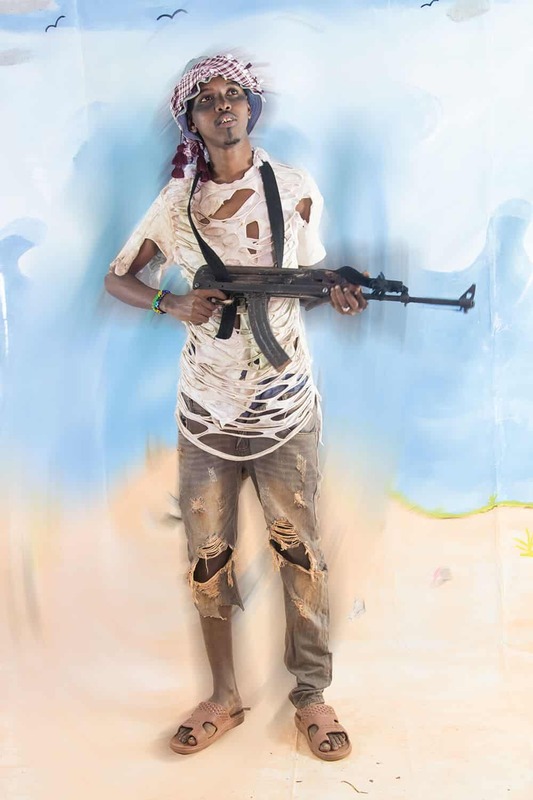 In the series The “Real” Somali Pirates, Hoek engaged with a group of men in Nairobi that pretended to be pirates to make a living out of fooling the Western media, who were in search of sensational stories about Somalian ex-pirates based in Kenya. Nicola Lo Calzo’s Tchamba is another highlight of the festival, a project in which the Italian photographer continues his exploration of the memory and the legacy of slavery and the resistance to it. After his trips in Togo and Bénin, this time Lo Calzo focuses on the social manifestation of “Tchamba”, the powerful spirit of the slaves that were displaced from North to South, during the transatlantic slave trade that took place from 15th to 19th centuries. The list of artists continues with well and less known names, like Kadir van Lohuizen, Dagmar Van Weeghel, Joel Lukhovoi, Mohammed Althoum and Lorena Ros, amongst many others – 37 in total! Jan Hoek, The Real Somali Pirates -Ahmali. Courtesy of the artist. In addition to the main exhibition, Nwagbogu’s led curatorial team will enhance the program with other events, workshops, talks and various parallel initiatives that will happen at the African Artists’ Foundation (AAF)’s headquarters and in other satellite venues situated in Lagos’ Victoria Island. This year edition of the festival will exceptionally enhance the public’s experience of and interaction with images, while the opening event anticipates the participation of internationally acclaimed performer artists from or based in Nigeria, including Wura Natasha Ogunji, Stacey Okparavero, Tito Aderemi Ibitola and Qudus Onikeku. As Nwagbogu states in the press release, the painful loss of Stanley Greene, LagosPhoto guest curator for the 2012 edition, will be the reason for paying a special tribute to this “warrior of truth”, who will be never forgotten by the AAF and LagosPhoto team for his “generosity and magnetism”. Jan Hoek, Ibrahim Tantuleuk. Courtesy of the artist. Today Lagos, one of the epicenters of contemporary art and culture in the continent, is still watched by the rest of the world with the same admiration, not only due its talented artists and erudite thinkers that the cultural industry promotes internationally, but also for the social and professional fabrics that support these talents and contribute to their exceptionality. So, LagosPhoto is justified in presenting itself as one of the most important contemporary photography events in Africa, that continues to gather local and international artists and audiences annually around the power of images. The sudden withdraw of Duro Olowu, fashion designer who is recently making his way into the curatorial industry and who was first invited as guest curator for LagosPhoto 2017, has not discouraged Azu Nwagbogu’s curatorial team, which includes Maria Pia Bernardoni, Nguveren Ahua, Uche Nwalozie, Asibi Danjuma and Karimah Ashadu and myself. Most of these names are employed full time at African Artists’ Foundation (AAF), a non-profit organization dedicated to the promotion and development of contemporary African art through a variety of programs and initiatives. Founded in 2010 by Ngwagbogu, LagosPhoto is part of a growing network of festival, biennials, institutions and independent initiatives that have turned lens-based art practice into one of the driving forces of the cultural industry in Africa, as well as a space for critical thinking and creative practice. Thanks to the work of artists, curators, writers and editors behind these events, photography has become, as noted by Nwagbogu, “a space where African contemporary visual history and culture can be negotiated”. LagosPhoto has grown in parallel with another festival in East Africa, Addis Photo Fest (AFF), initiated in the same year by award-winning photographer and cultural entrepreneur, Aida Muluneh. These two festivals make up the well-known Rencontres de Bamako, the Malian biennial of photography founded in 1994 by the French photographers Bernard Descamps and Françoise Huguier, who first exposed some of the great names in photography, like Samuel Fosso, Seydou Keita and Malick Sidibé. Curated in 2015 by Bisi Silva – the first African curator to be invited to curate this French-funded event – the Rencontres will open this year immediately after LagosPhoto. Titled “Afrotopia” it results from the collaborative work of a team of curators led by Marie-Ann Yemsi, that includes Nwagbogu. Beyond these event-based enterprises, the African network of initiatives dedicated to contemporary photography includes many other long-term projects, platforms and workshops, covering the region from South to North and from East to West. Some of these have been featured recently in the publication Platform Africa (by Aperture magazine), namely the Sudanese Photographers Group (Sudan), the Contemporary Image Collective (Egypt), the Invisible Borders Trans-African Photographers Organisation (Nigeria) and the renowned Market Photo Workshop (South Africa). Jan Hoek, Ahmed – Captain of the Boys. Courtesy of the artist. Alongside the numerous initiatives related to photographic culture, contemporary art is one of the leading sectors of the cultural industry on the continent, despite the evident deficit in art education, identified as a big issues to be resolved. In the last few years, especially in South Africa, universities have engaged in the necessary process of decolonisation, turning into the terrain of epochal debates that have spread globally. This also suggests that a closer relationship between academics and art practitioners would be an enriching exchange at the level of art and research production. In general, the role of biennials, festivals and other curated non-commercial initiatives are complemented and facilitated by the work of both big and small commercial galleries and art fairs, which link art practitioners to the market, on the continent and globally. In this sense, despite the lack of public funding to the contemporary art industry and the consequent over-influence of the international market, there is a sense of encouraging collaboration between non-commercial and commercial entities on the continent. This often creates situations of conflict of interests between public and private initiatives, but it is currently the way in which, little by little, an art ecosystem is being created with trust and enthusiasm. All the players are progressively becoming aware of the importance of supporting art practice curatorially, discursively and financially – as a way to enhance its symbolic, socio-cultural and economic value at once. After all, the conflict between the two essences of art – as a mean for freedom and social emancipation and, at the same time, as proprietorship of a priced manufactured and limited good  – is an inalienable feature of our, sometimes beloved, sometimes hated, art world. Mariella Franzoni is a researcher, independent curator and advisor based in Barcelona (Spain) and Cape Town (South Africa). With an academic background in anthropology, art theory and cultural management, she is currently working on her PhD at the University Pompeu Fabra of Barcelona and is affiliated to the University of Western Cape. I refer to Chinua Achebe’s essay “The Truth of Fiction” (1978). Jean Baudrillard, L’Echange symbolique et la mort (1976). Andrea Phillips (2015). “Art as property”. In Angela Dimitrakaki and Kirsten Lloyd. Liverpool: Liverpool University Press, pp. 33-48. FEATURED IMAGE: Osaretin Ugiagbe, Nigeria, 2017. Courtesy of the artist.